Salmon caught before 16 June must be returned with minimum delay and injury. In addition, any sea trout (sewin) caught after 1 September must be returned. Anyone that is prosecuted by the Environment Agency and is reported to this association as having been prosecuted by the Environment Agency whilst holding a current association permit will be barred from the association for poaching our water. Live baits: may only be used in the water from which it was taken and only during the same period of fishing. Ground bait: ground or feeder bait is not allowed at any time. Maggots and pupae: maggots, pupae or non-aquatic larvae are not allowed. Worms, fly, spinner: only natural earthworm or artificial fly or spinner may be used.When fishing for salmon, trout and other salmonids, a separate rod licence is required for each or any rod that is in use. On the river Loughor, no more than one rod and line may be used at the same time. Unattended rods: a must not be left unattended with its bait or hook in the water. It must be possible to exercise immediate physical control over any rod and line left with its bait or hook in the water. Association bag limits for salmon and sea trout: a daily bag limit of two salmon and four sea trout; and A weekly bag limit of five salmon. Use of a gaff or tailer: the use of a gaff or a tailer is prohibited at all times when fishing for any fish on the river Loughor. Removal of fish: no live or dead fish may be removed from any waters within the Agency’s area except legally by rod & line, other than with special written permission obtained in advance from the Agency. In all cases, where an angler is 12 years of age or older, they must hold a valid Environment Agency rod licence. 3rd March - 30th September. 20th March – 17th October (Fly & spin only). Fly, spin & permitted baits from 15th April – 7th October. Fly, spin & permitted baits from 16th June – 7th October. No member shall be allowed to take a dog with him/her whilst fishing the Association waters. Any member fishing the Association waters must keep to the banks of the river. Anyone breaking fences, walking through standing hay or corn, or leaving gates open, on complaints from tenant or land owner, will be liable to expulsion from the Association. Fair angling by one rod and line only. Permits are to be shown on demand to a Water Bailiff, a Police Officer and the Association appointed Keepers, the Land Owner or any other member of the Association. Permits are not transferable. of 30 minutes of fishing the same part, must do so. A reward will be paid to anyone giving such information as will lead to the conviction of any person liming, fishing with salmon paste or roe, using explosives with intent to take fish thereby, or using any other illegal instrument for fishing purposes in any water over which the Association has any rights or privileges of fishing. Any person having such information should immediately contact the Association’s Officials or Keepers. 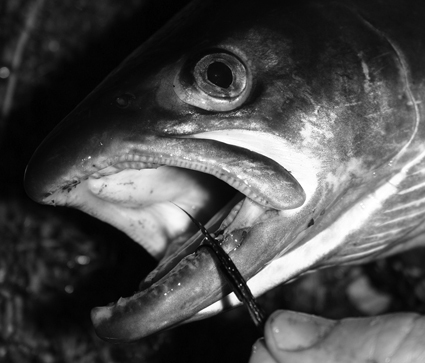 Catch limits are: Sea trout (two in a period of 24 hours). This applies from the start of the season up until the catch and release period, which is the 1st September on the River Loughor only. Salmon (limits to match those of the NRW). Compulsory catch and release of any sea trout caught from the 1st September to the end of the season. From the 1st September, anglers to use only one hook (single, double or treble) on any fly or lure (e.g. one treble hook on rapalas, no flying trebles on flies etc). This is to enable easier release of fish and applies to the River Loughor only. Note: All PAA members are provided with a complete copy of the Rules and Constitution.